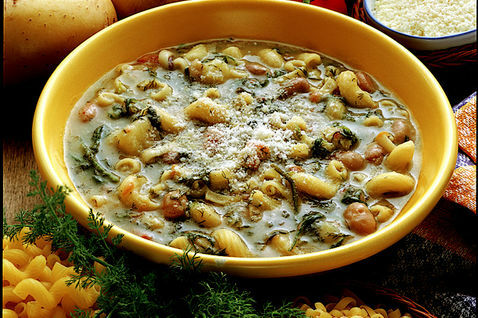 Today we want to offer a Sardinian recipe, an authentic dish coming from the “cucina povera“: a magnificent soup, really tasty and of course very filling. Soups in winter time are really spread in Italy and the main ingredients are beans or legumes such as lentils, peas and green beans, and if you think they are boring, just have a look to the exciting result you can have fom such a simpl mixture of ingredients!!!! Here for example the twist in the flavour is given by the wild fennel, the “secret” ingredients: you need to serve the fronds and the tasty leaves, not the bulb fennel. Rinse the fennel fronds, pad them with a clean cloth until dry, and chop them in little pieces. In the while blanch, peel, seed, chop, and drain the tomatoes. Heat the oil in a soup pot, stir-fry the tomatoes for a minute. When they begin to wilt, add straight away the beans, the fennel fronds, the potatoes pieces, and pig rind. Add from 2 up to 2.5 l. of water. Cover and simmer the soup for at least two hours. Remove the pig rind, season, and stir in the pasta. Continue to simmer, mixing occasionally to avoid the pasta stick and burn. Serve with grated cheese you have chosen. A variation: iyou can also use 100 g. dried tomatoes. Put it in warm water and then finely chopped before adding it to the soup. This entry was posted on Wednesday, November 14th, 2012 at 10:29 pm	and is filed under Italian Recipes and Food. You can follow any responses to this entry through the RSS 2.0 feed. You can leave a response, or trackback from your own site. Hi.. I know it’s been a while since this was posted but, would you know what type of pasta they would use?… which flour it’s made from?